Play Assassin's Creed Syndicate for FREE! 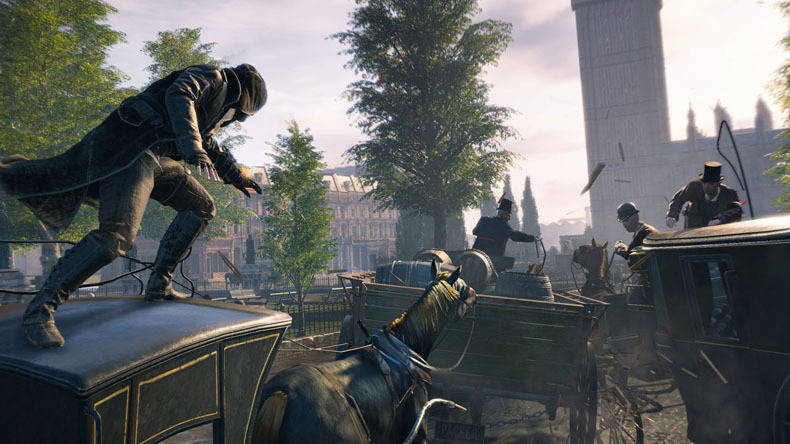 Quote Reply Topic: Play Assassin's Creed Syndicate for FREE! Nov, 16th 2015, Taipei, Taiwan ? 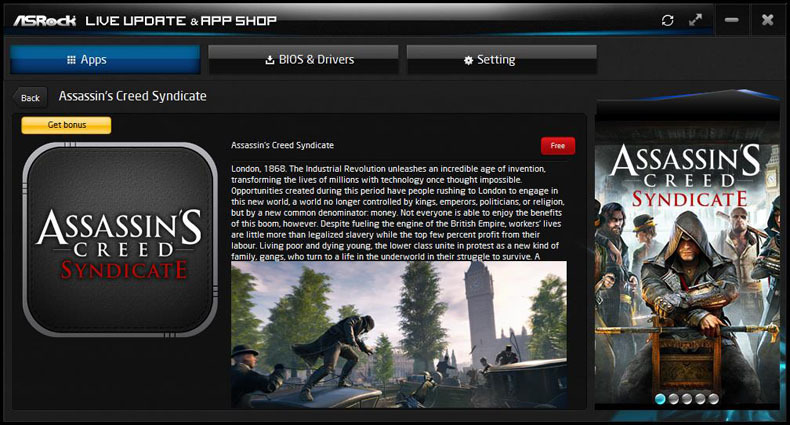 ?The global leading motherboard brand ASRock is offering limited Assassin's Creed Syndicate game codes with purchase of selected ASRock Intel® 100 series motherboards within the promotion period. Assassin's Creed Syndicate game codes will be available on ASRock APP Shop for redemption starting from Nov. 19th, 2015. Buyers of exclusive bundled motherboards in selected regions of North America and Europe will be granted a FREE offer of Assassin's Creed Syndicate game code worth US$59.99! In the latest Assassin's Creed saga, the Assassin's Creed Syndicate, you'll play as Jacob Frye, an assassin born and bred poised to take over the criminal underworld of London during the Industrial Revolution. Amidst blossoming conflicts between newly crowned kings of industry and the working class they exploit for all they're worth, Jacob will work in the shadows as he climbs to the top of the criminal underground as the head of one of the city's most notorious street gangs. In the latest Assassin's Creed saga, the Assassin's Creed Syndicate, you'll play as Jacob Frye, an assassin born and bred poised to take over the criminal underworld of London during the Industrial Revolution. Amidst blossoming conflicts between newly crowned kings of industry and the working class they exploit for all they're worth, Jacob will work in the shadows as he climbs to the top of the criminal underground as the head of one of the city's most notorious street gangs. ASRock APP Shop is an all-in-one utility designed for system update and software downloading. It is integrated with a variety of applications and support software. The ASRock APP Shop provides the latest BIOS updates and system upgrade software for users to download. You can easily optimize your system and keep your PC up-to-date with the ASRock APP Shop. What's more? The ASRock APP Shop is geared up with numerous popular PC games, making it easier for gamers to hookup to the gaming world. You can also receive exclusive bonuses, in-game items and experience the premium gaming feast on the ASRock APP Shop!! Assassin's Creed Syndicate promotion is only available for purchase of exclusive bundle models within promotion period of Nov. 14th, 2015 AM00:00~Jan. 4th, 2016 PM11:59 (UTC+8) in selected regions of North America and Europe while supplies last. Come and get your FREE game code now!! I have a code for this game that came with my samsung 950 pros. I will never use it. If someone would like to play this game just pm me and it's yours. I went trough the process of getting the free copy of Assassin's Creed Syndicate through the AppShop. After completion, it said my information would be verified and I would get my game within 72 hours after approval. It has been almost a month and still nothing. No word on whether I have been approved or denied (although I don't know why I would be denied since I sent them everything they asked for). I tried to get this and it doesn't work I went to bonus button and put the info in it with serial # of motherboard and getting error message stating check serial number I put the correct number in it and I would like to get free copy since I spent almost $200 for my gaming ASRock motherboard. Can some one help me or give me the code for the game please? I received my code within a day or 2 of submitting my request.